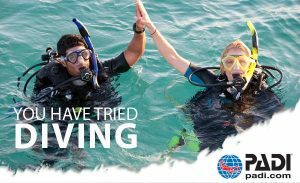 The PADI Discover Scuba diving experience is excellent for people who have a morning or afternoon to experience the underwater world, where you will complete a short confined bay session with scuba equipment, and then be taken to the Mediterranean sea for your scuba dive in the clear warm waters full of aquatic life, whilst under the close supervision of your PADI instructor. A great way to experience diving in a safe environment! For ages 12 years & above.